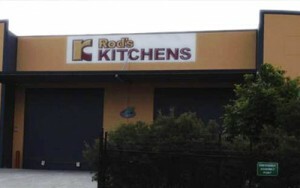 Rod’s Kitchens have been specializing in designing and installing custom-built kitchens since 1979 from a factory in Underwood. As of 2008, we moved our new larger premises at Meadowbrook. Producing on average 10 kitchens a week, we are large enough to enjoy bulk buying privileges but small enough to offer old fashion personal service through honesty, integrity and a strong desire to please our customers. With over 30 years’ experience and more than 20,000 kitchens under our belt, we know how to get the best results for our clients. This stems from the personalization of our service, the dependability of our staff, and the transparency and trustworthy nature of our service. Great kitchens are not the result of architectural skill or large budgets. Great kitchens are developed through relationship building and collaboration between the kitchen designer and the client. Through the sharing of concepts and ideas between the end kitchen user and the highly skilled designer, Rod’s Kitchens can transform a client’s wishes into a practical, ergonomically functional layout within the available space and budget. The result is a space that is aesthetically pleasing and a joy to live and socialize in. Our team truly listens to our client’s design and project requirements to tailor each project to the individual client. It’s our customers who make us the experts. People are generally good designers themselves and they know what they like and want. We see our role as augmenting and improving our clients’ ideas within a professional framework. We are one of the few companies who won’t make our clients wait for next steps, instead supplying a drafted floor plan and written quotation by the end of the meeting. We know the kitchen represents a big part of the home and is a big decision, hence we’ll give you the space to decide. 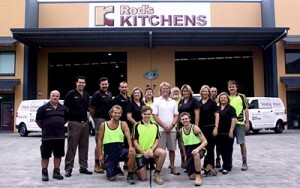 Unlike others, there’s no hard sell or high pressure sales with Rod’s Kitchens. When we kick off the project, we only require 10% upfront deposit on the job as we have the industry relationships to rely less on upfront cash. We go the extra mile to provide support and maintain the relationship with our clients after the job to ensure they are satisfied with the end product. If you’re planning to build a new kitchen or renovate, and are looking for a company that will listen and deliver on their promises, then get in touch via the contact form or phone and one of our friendly team members will be able to assist you! We even have a whole wall in the showroom dedicated to the kind words of our clients. Our focus has been on our clients and ensuring they are thrilled with the results of our work. Each and every staff member is focused on looking after the client above all else.